Paul is not amused at Caroline and Paul's relationship - how do they think Beverly will feel? Jim reminds him that this is the first time he's thought of her feelings. PAUL: That was different, dad. That was business. JIM: Yeah, well this is none of your business! PAUL: Oh isn't it? Gee well I guess y'know I would of thought that my father having a fling with my assistant here would have been of some interest to me! He reminds him about the laughing stock he became after Zoe. EDDY: Uh oh, bossy britches at twelve o'clock. DOROTHY: My aren't we looking dapper? HAROLD: How are you today? Dorothy mentions how smitten her father is with Madge - she hopes they don't run off together as where would that leave them? Harold is shocked and runs off to the kitchen. Eddy decides to let her in on the joke. 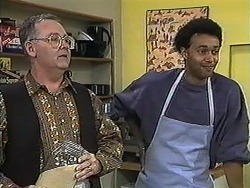 EDDY: He thinks you want his body! DOROTHY: His body! Whatever for?! She agrees to play along. Madge is talking to Tracey. She goes to wash her hands and they discuss how tragic her mother Sonia's death was. Rosemary is still having doubts about looking after her. 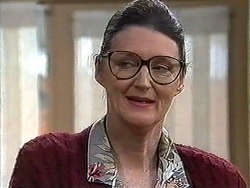 Helen reminds her that she and Tracey do have something in common - Sonia. Rosemary has been avoiding the subject like the plague but Helen and Madge think she should share some memories. Paul is complaining to Chrissie about Caroline and Jim's relationship. 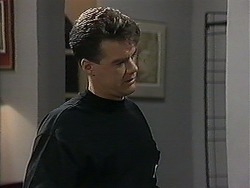 He is acting like the father of the relationship and insinuates that he is going to break the news to Beverly. Harold tries to nip Dorothy's ‘feelings' in the bud but she continues on with her declaration of love. DOROTHY: It's hard - very hard. Just recently I've missed having a man in my life. Someone big and strong, someone to make me happy - someone like you Harold. He counters that he loves no-one but Madge so she reluctantly accepts that they will never be together. DOROTHY: I'll learn to bury these feelings I have for you deep, deep down. As soon as Harold exits Dorothy and Eddie burst into laughter. Helen wants the truth from Jim - three nights in a row in expensive restaurants. He admits he is seeing someone but Helen is gutted for Beverly. Helen asks who the woman is but Jim refuses to tell her - the fewer who know the better. She warns him to tell Beverly before someone else tells her first. Eddy is stirring between Madge and Harold. He mentions Harold's admirer. 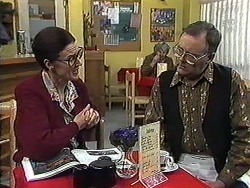 EDDY: If the truth be known Madge my dear there's a whole stream of them lining up outside the coffee shop everyday. Harold has to beat them off with a stick. 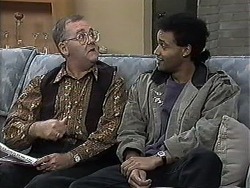 EDDY: Oh Harold admit it, ever since you've been wearing that fancy new clobber girls can't keep their hands off you! Eddy has a date so leaves the ‘lovebirds' together. Madge demands who to know who the mystery admirer is. Madge begins meowing and purring in a rather terrifying way. 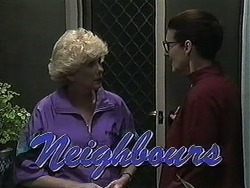 Rosemary is finally confronting the subject of Sonia with Tracey. However, she is focussing on her death rather than happy memories and Tracey gets upset and asks to leave. Caroline and Jim are having dinner; Jim is apologising for Paul's overreaction. She asks who Zoe was, Jim tells her she was also Paul's assistant and when they got involved many eyebrows were raised at the age difference. Paul and Chrissie are going to the movies; she is glad he didn't tell Beverly. He still isn't happy - this is either a rebound or a midlife crisis. Chrissie disagrees - Caroline is too smart to fall for that. Helen has found some things of Rosemary's from when she was younger; she shows them to Tracy. There are some photos of Rosemary and Sonia as schoolgirls, and a toy horse. Helen tells a story about them picking flowers and trying to sell them back to the growers to pay for a horse before they got caught. HAROLD: It would seems that I have become, inadvertently, the focus for Dorothy's passion. HAROLD: Don't cry my love! I assured her that I have no passion in my life for anyone but you! The game is up - Madge reveals her involvement in the trick. He thinks two roses are overkill, but Madge only sent one. He tells her about Dorothy telling him about her ‘arousing' (shudder) feelings for him and she storms off to give Dorothy a piece of her mind. Jim and Caroline are kissing and hear a car, but Caroline stops him from running out the back door. Paul does not look impressed when he finds them together. Madge storms to Dorothy's house. She is not amused that Dorothy is ‘trying to steal her husband'. A somewhat bemused Dorothy tries to explain but Madge is having none of it.